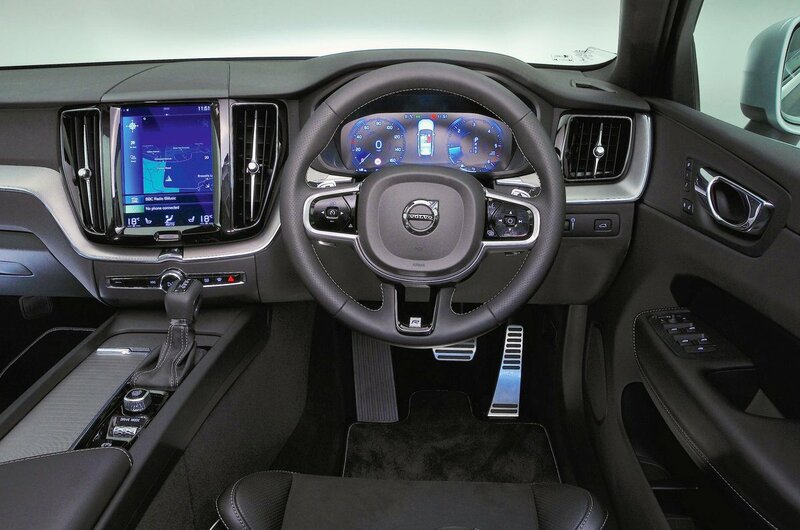 Volvo XC60 Interior, Sat Nav, Dashboard | What Car? Volvo claims that the XC60 feels quite ‘car-like’ inside, seating its occupants lower and in a more cocooned environment than many SUVs. In reality, though, you still look down on most other road users – and that's precisely what most buyers will want and expect. The fundamental driving position is superb, thanks to plenty of adjustment in the steering wheel and the comfortable and supportive driver’s seat. 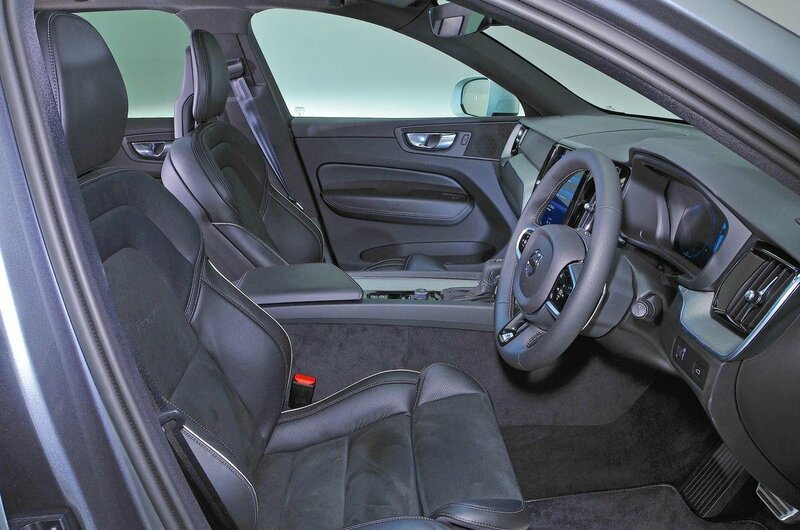 Seat height and lumbar adjustment is electric on all trims, but you have to slide the seat back and forth and recline it manually on Momentum and R-Design models; full electric adjustment with memory recall is standard if you opt for the Pro Pack or go for top-spec Inscription trim. Meanwhile, the pedals line up neatly with the steering wheel to ensure there’s no skewed driving position and the dashboard buttons are kept to a minimum. That last point sounds fabulous, because it delivers a dose of smart-looking simplicity to the interior; the only problem is this means you have to prod away at the touchscreen to adjust even the most mundane features, such as the air conditioning, when physical buttons or dials would make the process far less distracting while driving. The excellent view out of the XC60 is partly down to its big side windows and door mirrors. However, it also has relatively slender windscreen pillars that make it easy to navigate roundabouts and junctions. Even the over-the-shoulder view is good by large SUV standards. Every XC60 comes equipped with rear parking sensors, making it easier to pilot the car’s considerable bulk into tight parking spaces. You can also choose to add front sensors, a rear-view monitor, a 360deg bird’s-eye-view camera and even Pilot Assist, which can semi-autonomously perform parallel parking or back you into a supermarket space. There’s no doubting the showroom appeal of the XC60’s Sensus infotainment system. The giant 9.0in touchscreen is wonderfully crisp and bright and, rather unusually, is set into the dashboard in portrait rather than landscape orientation. However, the fact that it’s a touchscreen means you have to accurately press icons – some of which are rather small – and swipe between menus. This is fine when you’re stationary, but it can be both annoying and distracting while you’re driving. That’s the main reason that other premium manufacturers, such as Audi and BMW, have opted for a more user-friendly rotary dial controller between the front seats. Following the sat-nav (standard on all trims) is harder than in some rivals, because it’s sometimes hard to see exactly which road you’re supposed to take. A DAB radio, Bluetooth and a 10-speaker stereo are standard, but you have to pay extra for Apple CarPlay and Android Auto smartphone mirroring. The optional Bowers & Wilkins stereo delivers seriously crisp and punchy sound quality, but you’ll have to really love your music to consider it because it’s very expensive. When it comes to interior quality, Volvo can now count itself among the best in the business. 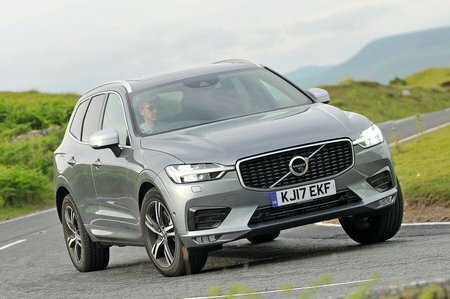 That the XC60 is as classy and elegant inside as the larger (and more expensive) XC90 is seriously impressive, and there’s really precious little to grumble about. The liberal use of woods and metal, especially on range-topping Inscription trim, lends the XC60’s interior a wonderfully light and airy feel. Okay, some of the interior panel gaps aren’t as millimetre-perfect as they are in the rival Audi Q5, but every surface you touch feels suitably upmarket and reassuringly solid. There aren’t many physical buttons and switches (Volvo prefers a more minimalist approach) but the few there are operate slickly and feel built to last.